Each year I try to make something really special for my husband for Christmas. I’ve painted for him these last two years (see the posts here and here), so I thought I’d do something different this time around. 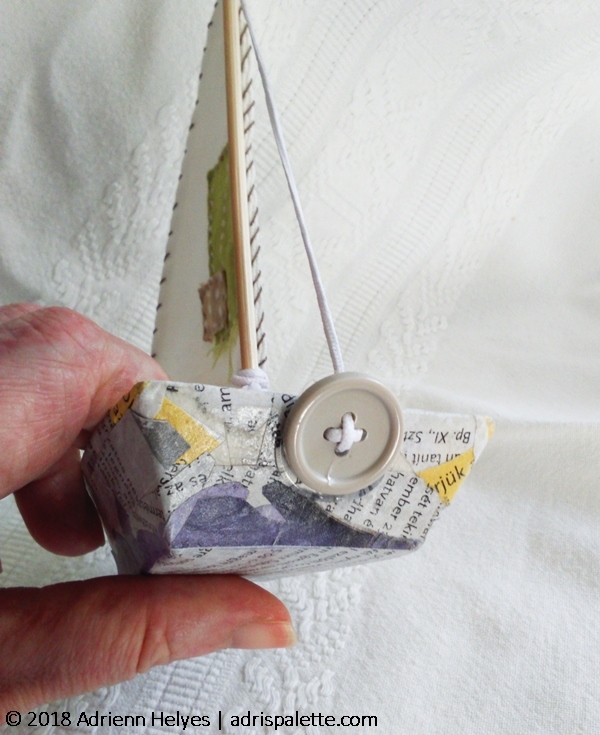 That’s when I saw Ann Wood’s post of a little paper mache boat for the little mouse I’ve made a couple of years ago (see post here). Since little Percy is still one of our favorite stuffed creatures, and… well, in all honesty, as soon as I saw the pattern my brain (and all remaining senses in it) clouded up, and all I could think about was I WANT TO MAKE THIS!!! I was commissioned to paint a painting for Christmas (more on that in an upcoming post). I knew I had to dedicate lots of thought and energy into it, which – with everything else in my life – was not going to be easy. So I figured, since I really love hand crafts, and I fell in love with this little project, making it could be the little meditative pause I need in between painting sessions. And how right I was! For when I felt my brain screech to a standstill after hours of painting, nothing could have freshened me up more than this! Every new ship needs its captain, therefore a new little creature was born to us. The mast of the ship is connected to a piece of cork that is glued to the bottom of the boat. The mainsail is tied to the mast using a beautiful bow. As it should be! 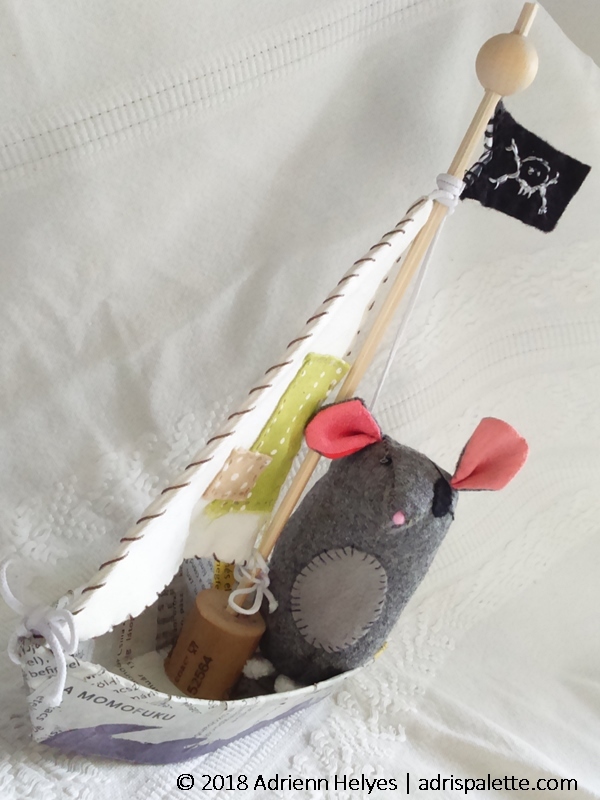 How much room does the pirate-mouse have in the boat? Well, he doesn’t have much room to run around, but he sits in there quite comfortably, thank you for asking! The backstay is attached to the stern with a big button. The original design called for a wash of blue watercolor to imitate the water. 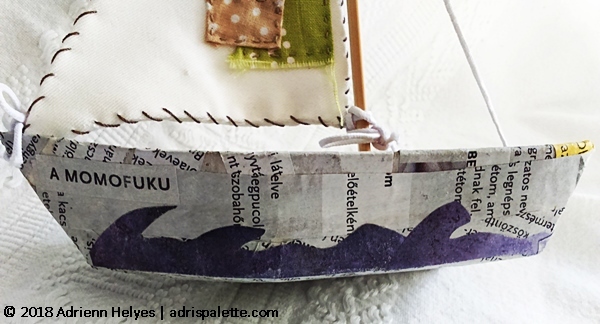 I chose to make some waves as part of the paper mache boat itself. I think it turned out so nicely! And the name? I christened the ship after a famous restaurant chain. I pride myself in being as creative in the kitchen as with art. And Mr. AP is my number one fan for sure! 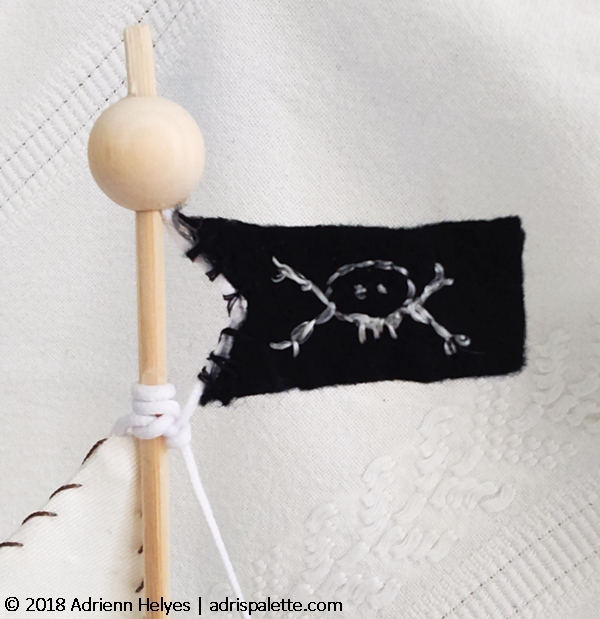 A flag with skull and bones completes the pirate ship. I embroidered the design free-handed onto a piece of black felt. 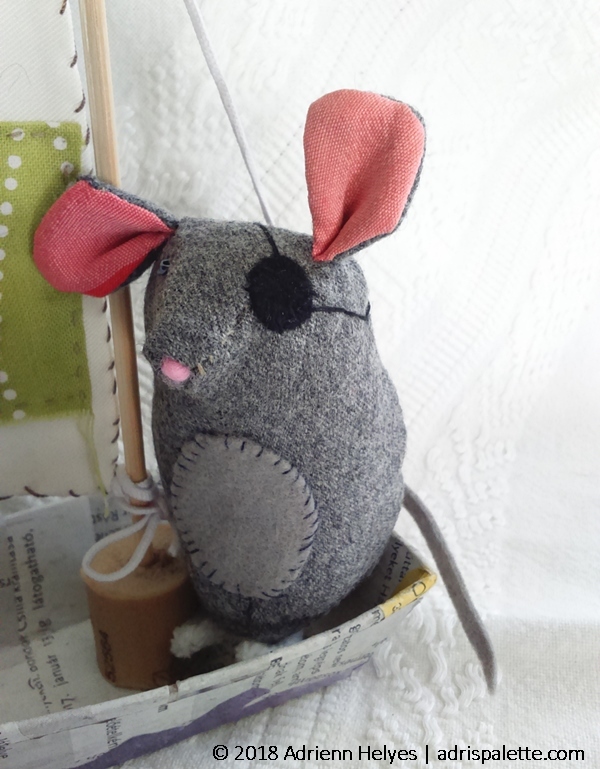 Ricardo, the pirate-mouse is made from a piece of vintage wool I had lying around. 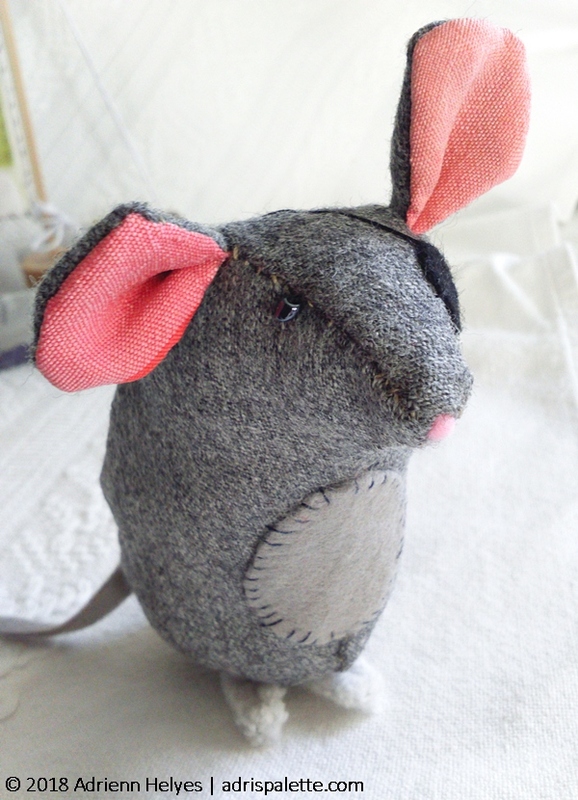 His nose and stomach are made from felt and his ears are lined with pink silk. He has a shiny beaded eye. And as for his arms, he lost them in the fiercest of battles mouse history has ever known. But don’t worry, this does not stop him. He is still the most formidable and feared pirate of them all! 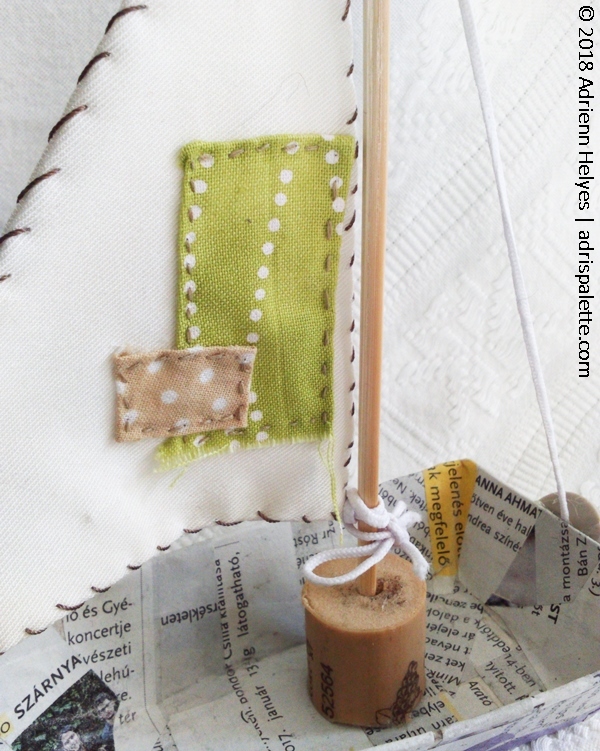 Making this little boat was such a pleasure! I had the most amazing time preparing the skeleton of the boat, then being covered up to my ears in paper mache paste. 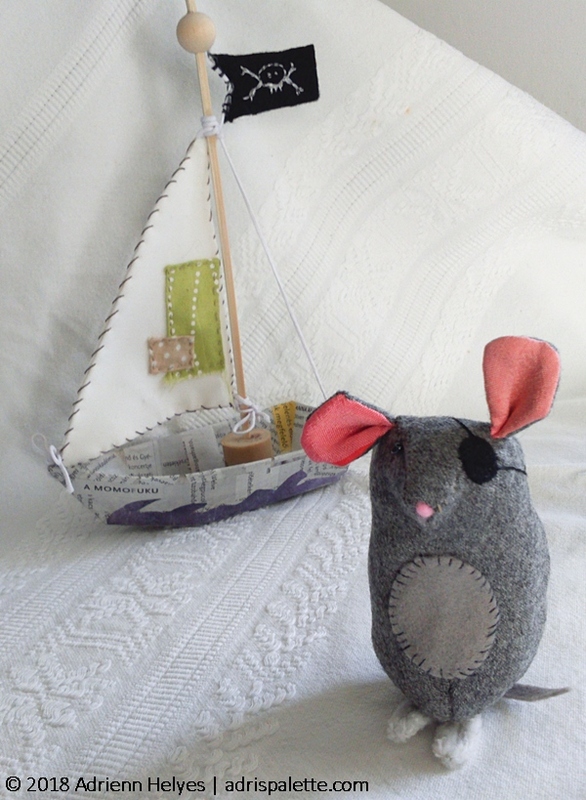 Looking for the perfect fabrics for the sail, the patches and the mouse. It was truly therapeutic after the intense periods of concentration I had to put into my painting sessions. There are just two things that I’d warn you about if you decide to give this project a go. First, if your fingers are sticky with the paper mache paste don’t scratch your eyebrows. You’ll glue them together and it cannot be removed… or if you try it will leave a bald patch for all to see (sigh). And last, but not least, if the intended recipient is in your vicinity you will not be able to squeal with joy or laugh with pleasure each time one of the little pieces is finished. And this, my friends, is really hard on any soul!